Communities of microorganisms live in and on and around all forms of life on Earth and in the planet’s atmosphere and oceans. Microbes account for a third of all planetary biomass and play vital roles in both sustaining human life and global ecosystems. Despite the importance of microbes and the habitats they affect, scientists are still struggling to understand how the metabolisms of these collaborative organisms connect to form cooperative communities: specifically, how they work together to acquire energy and nutrients from the environment. 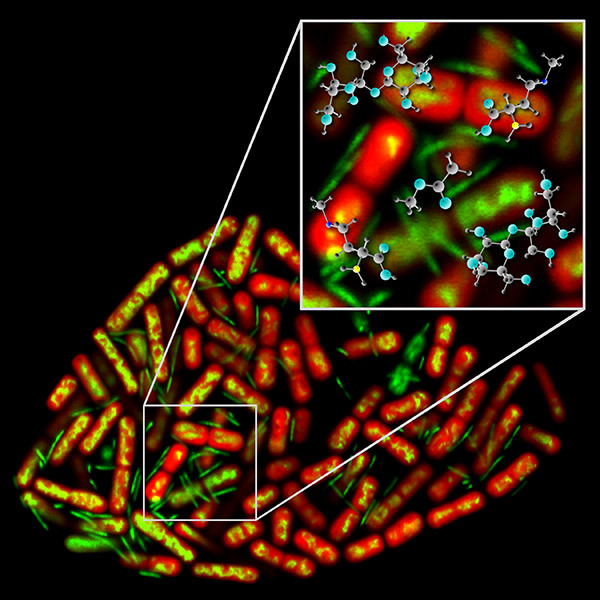 A new paper in the Journal of Cellular Physiology proposes a novel way to model and predict the metabolic interactions across species in microbial communities. It is authored by five researchers at the Pacific Northwest National Laboratory (PNNL), along with two colleagues at Argonne National Laboratory. Results: Researchers employ genome sequencing to study microbial networks and their diverse, mixed-species cast of players. But since current sequencing methods can't read a whole genome at a time, scientists reassemble fragments of sheared DNA to reconstruct the genomes of individual species. By combining these single-species reconstructions and by finding where genes are and what they do, it is possible to estimate a microbial community's metabolic architecture and functional capacity. The ultimate goal is to predict a microbial community's metabolic interactions and community behaviors. This conventional approach for community network building becomes ineffective, however, when species cannot be characterized in isolation, a problem attributed to more than 99 percent of microbes. So the PNNL researchers and their collaborators developed a new approach that reconstructs metabolic networks using readily collectable "community-level" data. It focuses on direct predictions of a community's interspecies metabolic interactions. The researchers validated the approach by means of an illustrative case study: a co-culture built from two microbes. Together, the two microbes were an experimental stand-in for the phototrophic-heterotrophic microbial communities found in natural ecosystems. Such communities in nature are robust, have diverse metabolisms, and change behavior depending on environmental cues, such as day-night cycles. That makes them interesting to scientists in search of the interactive mechanisms that characterize global biogeochemical cycles. In this study, researchers used the two-microbe bacterial photoautotroph-heterotroph consortium to provide data needed for a community-level metabolic network. Their resulting simulations provided experimentally validated predictions of how a photoautotrophic cyanobacterium supports the growth of an obligate heterotrophic species by providing nutrients: organic carbon and nitrogen. Why It Matters: Microbial communities are of increasing interest to researchers in a wide variety of disciplines, including soil ecology, agriculture, food safety, environmental engineering, and medicine. Scientists are eager to understand the organizational principles that sustain microbial communities and how they take cues from their miniature environments. They foresee a future in which such microbial communities can be designed and engineered for "controllable outputs" such as biofuels. It helps that advancements in multi-omics analyses have significantly expanded the volume of biological data at hand, as well as our collective biological knowledge. However, the experimental determination of diverse forms of microbial interactions in a community still remains a challenge. Metabolic network analysis as explained in the paper provides comprehensive predictions. They can lead to useful hypotheses on how the mixed species in a microbial community exchange metabolites to sustain life. Methods: The research team used the example of the T. elongatus-M. ruber co-culture to construct community metabolic network models in two different ways. In one approach, they built the network model by combining individual networks that are refined using single species-level data. This includes experimental observations on the growth of T. elongatus on autotropic media and M. ruber on rich Lysogeny broth media, respectively. No community-level refinement was made in this case. In the second approach, they first combined individual draft networks (without refinement) and then refined the integrated network using community data (such as their growth as a community) on specific media. In both approaches they used the U.S. Department of Energy's Systems Biology Knowledgebase (KBase) platform (www.kbase.us) with a focus on the automated reconstruction and refinement of draft networks. They evaluated the qualities of resulting networks in two ways: first, by predicting potential metabolite exchanges between T. elongates and M. ruber; and second, by assessing the consistency between a model's flux predictions and its active/inactive gene activity. In both cases, community data-based network reconstruction led to much more plausible predictions. What's Next? Manual (not automated) curation is a necessary next step for more accurate predictions. Further developments using KBase are in progress. The authors will extend the proposed method to more complex communities: those that drive geochemical cycles in nature and those that can be redesigned to sustainably produce fuels and bioproducts. This work was supported by the Genomic Science Program (GSP), Office of Biological and Environmental Research (BER) and U.S. Department of Energy (DOE) under contract DE-AC02-06CH11357 as a part of the DOE Knowledgebase project (CSH, PW) and as a contribution of the PNNL Foundational Scientific Focus Area (HCB, RCT, JYL, JZ, HSS). Author HCB also received support from the Linus Pauling Distinguished Postdoctoral Fellowship, a Laboratory Directed Research and Development program at PNNL. Sponsor: The U.S. Department of Energy's Office of Science, Biological and Environmental Research supported this work, via the Genomic Science Program. Reference: Henry CS, Bernstein HC, Weisenhorn P, Taylor RC, Lee J-Y, Zucker J, Song H-S. 2016. "Microbial Community Metabolic Modeling: A Community Data-Driven Network Reconstruction." Journal of Cellular Physiology, in press. DOI: 10.1002/jcp.25428.